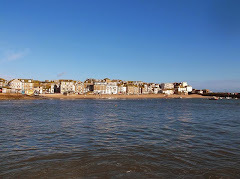 This Monday - 7th February - is St Ives Feast Day. 09.30 am - Mayoral Procession - Venton Ia Well. 10.30 am - Hurling of the Silver Ball - St Ives Parish Church. 10.30 am - Coffee Morning - St Ives Guildhall Community Room. 11.00 am - Western Hunt Meet - Royal Square. 12.00 pm - Return of the Silver Ball - St Ives Guildhall. 12.15 pm - Distribution of Pennies - St Ives Guildhall. 19.30 pm - Feast Monday Rugby Match - St Ives RFC. I always look forward to Feast Day. For me it marks another milestone in the St Ives year, some traditions unique to our town and the coming end of Winter.